When I think of autumn I envision warm colors, good food, and gathering together with family and friends. Everyone has come back from their summer travels and has entered into a steady routine of work or school. It's a time of great activity but also one where we begin to enter into a season of hygge. 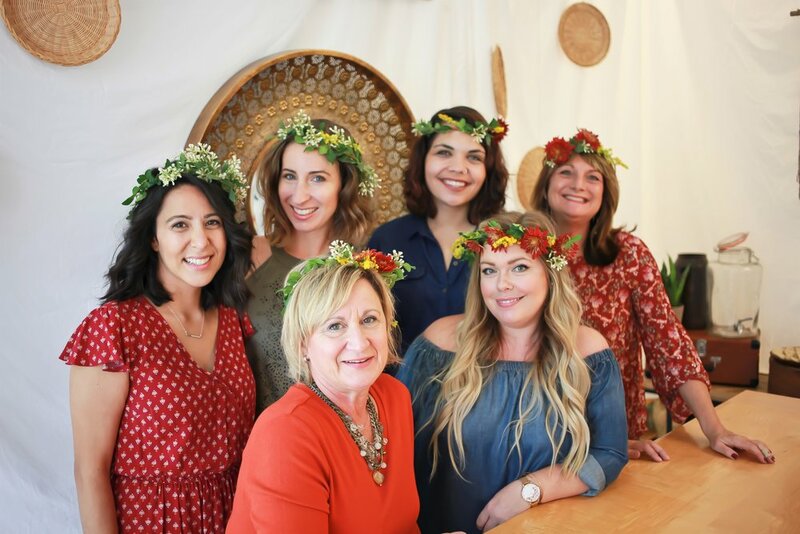 To celebrate this turn of tides I recently partnered with my friends Anna Hubbard of Hip Innovative Studio Boutique and Diane Fulton of Front Porch Flower Co. to host a brunch for some girlfriends. It was a wonderful excuse to play with seasonal flowers, eat some wholesome food, and catch-up with the girls. While this is by no means criteria for hosting a brunch of your own, the stylist within me saw this event as an opportunity to create something extra special. To get things rolling, I started off by creating a mood board. As the date of our gathering fell in between the transition of seasons I wanted the vibe to be Indian-summer meets autumn. Rich, saturated hues contrasted against crisp whites and fresh greenery was the desired color palette; bohemian and yet fresh and tailored. The use of woods, woven baskets, and metalic accents helped achieve this look. As with all events that I style for, I used a combination of items sourced from our home with ones created and purchased specifically for the event. I'm a big believer that good styling and design does not have to be expensive. There are so many items lying around all of our homes, its up to us to notice them and imagine how we can use them in a new way. In the end, the items that I did go out to purchase were minimal and inexpensive. They were pieces that I purchased with the intention of being used again and again in our home and for future events. These new items were mixed in with high (i.e. our flat ware) and low (i.e. these votives) cost pieces, creating a look that was both casual and elegant. 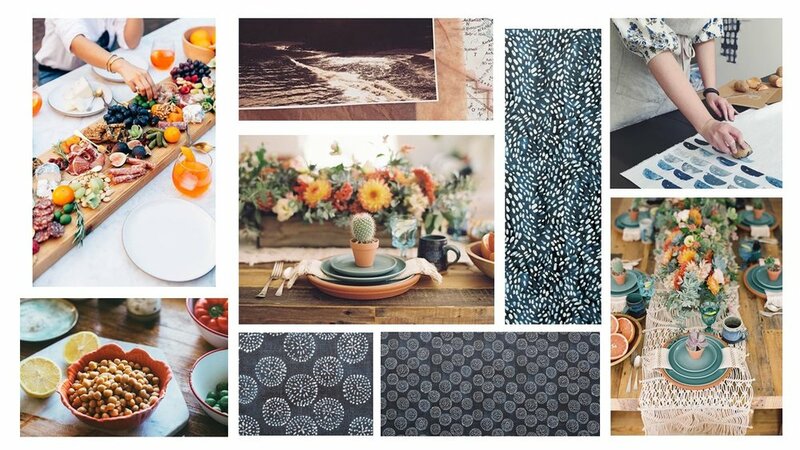 While normally my table linens consist of throwing a canvas sheet on the table topped with a woven runner, I saw this autumn brunch as an opportunity to shake things up and do something new! For months now I have been admiring the look of Shibori and so I decided that I wanted to make something similar. To do this I enlisted the help of my friend and local artist, Renea Suttle, to guide me in the process. Using a variety of techniques based off of Annie Sloan's book Annie Sloan Paints Everything, we spent a warm summer afternoon experimenting various methods; quickly becoming addicted. For the table cloth we used a method similar to Shibori, folding the cloth concertina style before dipping each edge slowly into a bowl of diluted Chalk Paint®. We found that compared to cotton the polyester in the table cloth helped the paint not to bleed so easily, creating a beautiful pattern. This was a great base to our table, as I planned on the rest of the space to be fairly neutral and simple. The morning of the brunch I met up with Diane to learn how to make autumn flower arrangements. Putting together bouquets is something that I have always enjoyed doing on my own but have never had any proper training and so, I was very eager to learn. 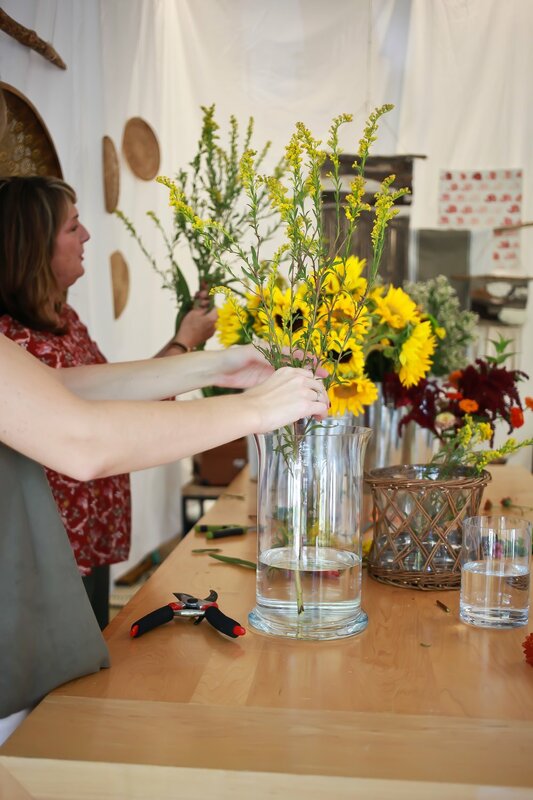 My time with Diane was such a gift as she spoke about the different types of flowers, how they were sourced, and the best way to group them. The colors that she selected were a wonderful range of warm hues that worked perfectly with our backdrop and table linens, creating just enough of a contrast. I found that Diane and I have a very similar taste in flower arrangements in that we don't like them to be "perfect" but rather a little loose and wild. When we were putting them together she explained that, "it's okay to be a little rough. Flowers, especially wildflowers, are used to being outside in the elements; moved around by the wind and animals." I love that. The menu for our brunch was a mixture of fresh, robust flavors pared with delicious sides. 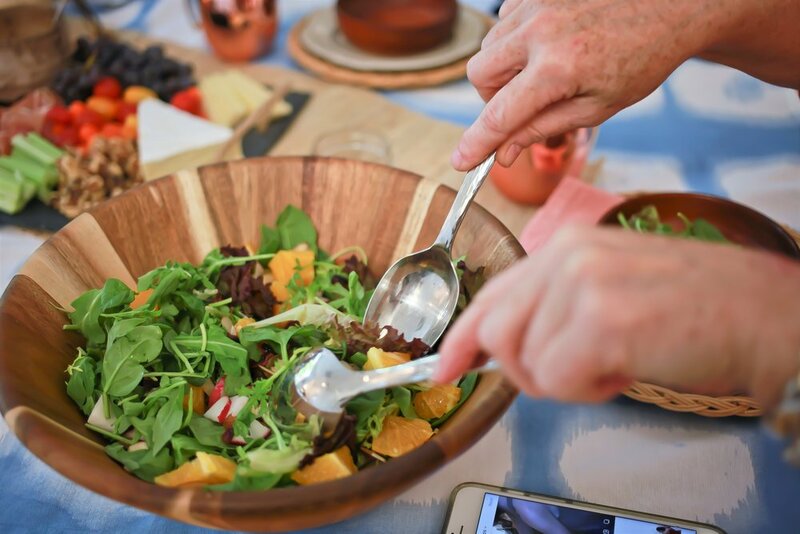 Going with the carefree theme of the day we kept it simple by offering a colorful citrus salad packed with nutrients and flavor. Fennel, radishes, mint, and cranberries were the stars of the dish. The addition of a cheese platter, walnuts, naan and fresh fruit made up the rest. The best part about the meal though would defiantly have to be the beautiful women who sat around the table... A mixture of ages and backgrounds made for interesting conversation as we put our phones down and shared life together, discussing everything from children, wellness, and our own creative pursuits. Though there is something to be said for the decor and the food of a gathering, the most important aspect of it all is the people there. They are what makes it truly memorable. Dried cranberries, walnuts, and sliced almonds to garnish. 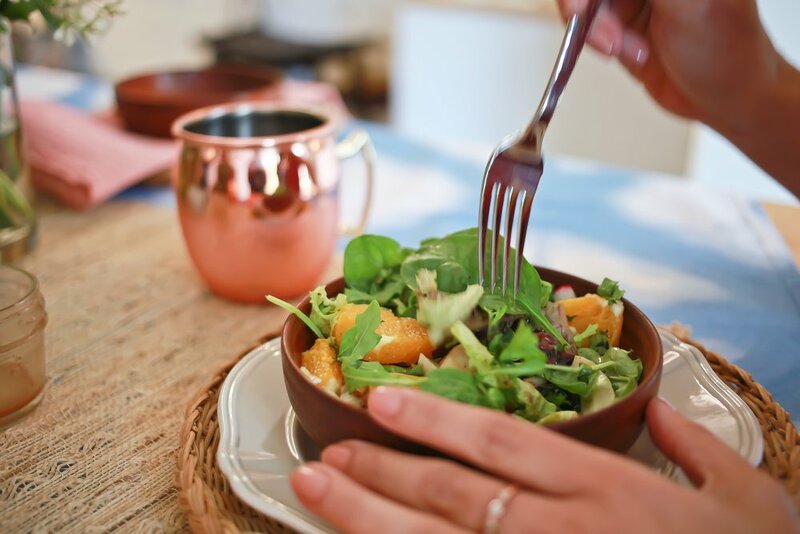 Mix salad ingredients together in a nice serving bowl. Serve vinaigrette on the side. Arrange ingredients on a medium sized platter or board.